WINNIPEG, Man. – The trucking industry has a lot of work to do if it wants to attract the next generation of workers. 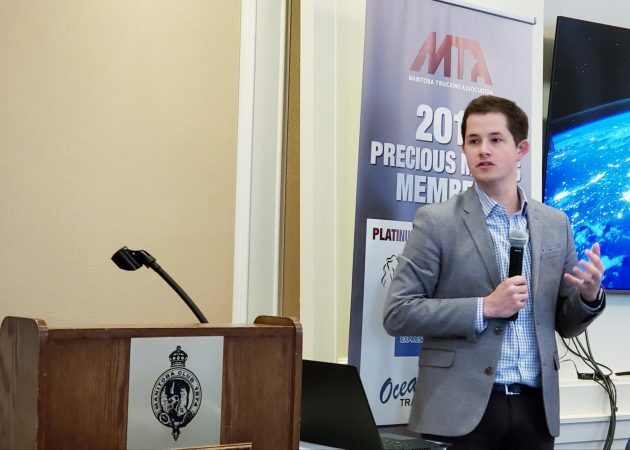 That was the message from David Coletto, CEO of Abacus Data, during a presentation at the Manitoba Trucking Association’s (MTA) 87th annual AGM today in Winnipeg. Having conducted research into the millennial generation and their willingness to enter trucking as a career choice, Coletto found there are several challenges facing the industry. One is getting young people interested in trucking. Abacus’ research found that 16% of men and 7% of women would strongly consider a career in trucking, while 29% of men and 62% of women would not even entertain the idea. Specific to Manitoba, Coletto said 14% of millennials are interested in a long-haul truck driving career, while 48% wanted a blue-collar job and 38% a white-collar career. Coletto pointed out that though these numbers seem low, with the number of millennial workers in Canada now the highest of any generation, having passed baby boomers in 2015 and numbering 9.5 million, they offer a large number of potential workers to the industry. With the average age of those in trucking now at 55, and only 15% under the age of 30, Coletto said the industry must change its approach to how it recruits young workers. “Doing the same thing over and over and getting the same optimal result is not going to work,” he said. Coletto highlighted a strategy he called “shift,” which pinpoints what he believes carriers must understand in order to help attract more millennials to their workplace. Coletto said “shift” means that millennials are “self-educators” and image driven; “hopeful” but increasingly anxious; require “impact” and passion in a career; need “feedback” that is personal and customized; and look for “transparency” and control in an employer. Data collected by Abacus suggests today’s youth have mixed feelings about the trucking industry. Fifteen percent say they have a bad or very bad perception of trucking, while 40% is neither good nor bad, and 46% is good or very good. Compared to trucking’s biggest competitor in the recruitment of millennial workers, 68% have a good or very good view of the construction industry while only 5% negative. In Manitoba, the numbers are slightly better, with 51% having a positive perception of trucking and 11% bad or very bad. Comparing the perceptions of men and women, Abacus found that 71% of women feel the trucking industry is unsafe, and 54% of men agreed. Both 61% of men and women believe those in trucking are well paid, but a mere 26% of women and 34% of men said it is enjoyable work. Only 22% of women and 24% of men feel a career in trucking would offer work-life balance, something important to millennials. Social media and other online sources are where Coletto said carriers must look to get the word out to millennials about what trucking has to offer. Facebook continues to dominate the social media platforms, with 68% of millennials using the site. YouTube is also popular, followed closely by Instagram, the fastest growing social media platform. TV news is watched by 31% of millennials, and 36% listen to radio news. Young workers who are actively looking for or have chosen a career in trucking did so primarily because of what they perceive as good compensation. Other factors included the ability to explore Canada and not having to sit in an office or have a boss in the cab. Manitobans who are interested in a trucking career note the high number of positions available as a drawing factor. They also said good pay, a chance to travel, and that both men and women are welcome were positive aspects. But Coletto underscored the fact that 48% of respondents, along with 55% from Manitoba, believe the trucking industry is not respected by others. Coletto said the industry must change this perception if it is going to attract young workers. Building what he called a “millennial-friendly sector” is key to achieving this goal, which includes companies outlining their intentions and purpose, being open and seamless, and providing constant feedback to employees. Fresh on the heels of a series of features depicting the changing face of trucking, Newcom Media’s Lou Smyrlis and Manan Gupta showcased the growing number of South Asians entering the industry. Smyrlis said the notion that the trucking industry cannot attract new drivers is a myth, but the reality is that it is not bringing in workers in quick enough to keep up with how fast the industry is growing. As of 2016, research from Newcom Media indicates there are 175,450 male tractor-trailer drivers in Canada and 5,880 women. One of the main concerns carriers have is the rising age of their workforce. Combined with 12% of drivers saying they plan to retire this year, and 30% in the next two to five years, carriers’ concerns are justified. The number of immigrant drivers, however, continues to grow, particularly from the South Asian community. In 2016, 32.5% of Canada’s truck drivers were immigrants, numbering 58,985, compared to 1991, when there were 7,390 immigrant drivers. Though South Asian populations are growing nationwide, Smyrlis said many who are in the trucking industry are located in B.C.’s Lower Mainland, as well as the Greater Toronto Area. Gupta, general manager of Newcom South Asian Media Company, said many South Asians who first immigrated to Canada were not in the trucking industry. But as more found success in commercial transportation by bringing their homegrown skills to the Canadian market, family members followed. Manan Gupta, left, and Lou Smyrlis. Challenges, however, still exist for South Asians in the industry, with the language barrier and, as a result, proper training, being at the top of list. Gupta said many South Asians from the Punjabi area in India come from a trucking background, though comparatively different than the tractors used in Canada. With Canadian driving conditions vastly different than what is typical in India, Gupta said training, such as mandatory entry-level training, and building a culture of safety is vital to South Asian success in the industry. Gupta believes the influx of South Asians into the industry will continue, as Newcom Media data indicates they have embraced trucking. Driving is not the only area where South Asians, who are characteristically entrepreneurial in nature, can thrive. Gupta said many have entered sales positions, as well as dispatchers, management, and ownership. Gupta also said companies can help attract more immigrant drivers by making an effort to learn and understand cultural differences, meet the needs of those elements, all while not hampering industry requirements. Angela Splinter, CEO of Trucking HR Canada, added that in 2017, Canada’s temporary foreign worker program brought in 1,700 drivers, and that trucking is considered to be a “high usage” industry of the program. She said the industry must ensure it is diversifying, including attracting more women, millennials, and Indigenous workers, all of which are large employment pools not well represented in trucking. Splinter said Trucking HR Canada’s largest current initiative is researching where the shortages are in the industry, and one component of that research is millennials. To whom ever is thinking about becoming a truck driver on public roads …………. I ask you to compare the construction trade and look at construction truck driver pay compared to city or hwy public truck driving . In the construction trade you have a pay scale which is much better and much higher . Therefore you will earn a higher wage through the construction trade as a truck driver than you would as a company semi tractor driver on public roads and that includes dump trucks which are grossly under paid . Plus you can choose too operate construction machinery such as bulldozers(excavation) ,cranes etc , which also pay a lot better than driving a truck on public roads . And you won’t have silly discriminatory laws hounding you , nor a silly ELD , nor risking your life and fighting with ignorant uneducated drivers on public roads . Quite frankly , driving a truck on a public road no longer offers a salary that justifies the headaches and risks involved . You’re better off getting educated in the construction trade if you like “labour” . Due diligence is key . Choose wisely ! Other factors included the ability to explore Canada and not having to sit in an office or have a boss in the cab. Trucking companies are seemingly increasing the methods of micro managing truck drivers by installing onboard cameras. These cameras have taking away the allure of feeling freedom of the road. Truck drivers have now become the most scrutinized workers of all professions. Amagine being under surveillance the whole time you are at work wether it’s short or long haul. Now, is that a good environment to be working in? No CEO would put up working in an office with cameras on them .Truck driving is already stressful enough and it’s getting worst. It sure seems that truck drivers do not have a say on what is good for them or how they feel about the environment they have to work in. Instead the trucking companies hire consultants who are not truck drivers for advise or to solve their problems on how to retain and recruit truck drivers. It is sad to see the profession that a love deteriorating because of the lack of empathy that CEO’s and managers have towards truck drivers. It’s getting worst and I’m losing patience. in all that has been said nothing about wage and ???? I suspect there aren’t 9.5 million millennial workers in a province of 1.4 million people. Perhaps trucking companies have to start realizing that driving a tractor-trailer today is a complicated job that requires knowledge and reliability similar to that of an airline pilot. The rules, regulations and knowledge of 70s trucking have changed dramatically as I witnessed after 12 years driving in the 70s to going back driving for a couple of years in the 20s. With the big, powerful tractors today and heavy weights hauled ( long nose Petes with two 53fts behind ) if a driver screws up it starts being like an airplane crash-landing on a super-highway. I don’t think we can avoid establishing a new respect for the modern drivers and probably higher pay too, however much push from traditional sources for that not to happen. Paying more means freight rates will rise but maybe that just has to happen and if it is across the board everyone will be paying more to keep things competitive. And if any trucking company tries to be competitive by paying less in wages it wont be able to hire and keep drivers. It may sound silly to some but perhaps drivers need to be put back into uniforms, like in the 70s and earlier, uniforms that look more like an airline pilot’s uniform. ( More respect would be given to a driver by a shipper or others in contact with him in a neatly pressed uniform than a driver in torn shorts, dirty sneakers and a grubby t-shirt ). Some would argue that comparing a tractor trailer driver, even an experienced, reliable employee, to a an airline pilot is nuts but if you think about it more closely you will have to admit that it would sure raise the prestige of driving a long distance tractor-trailer across North America. I was a over the road driver from 1960 to 2002 and one of the main reasons I retired was the stupid enforcement of rules such as driving times, speed, traffic and hundreds of stupid aggressive truckers. The last 10 or 15yrs I would never drive on the 401 during daylight hours between London and Quebec. Drivers pay is much better today than when I drove but you are restricted to a limit of hours. In 1960 I got 4 cents a mile driving between Welland to Tampa area. Millennials are not interested in being lonely by them selfs without internet connection and not a possibility of looking at their smartphones or tablets for hours when driving trucks as well seating at shipping and receiving docks without sometimes access to a decent washroom and sometimes not even a portable one. Not being able to shower every morning have gem and human connection. Trucking is mostly for people who can work without supervision and can deal with loneliness and they just not fitted for it as well most of women. Who wants to be away from home for week or weeks away from home and how to menage a family from far away or even make a family in today’s times. Hi-once again, with 60 years in the industry as driver-salesperson [trucks] driver training-Commercial accident investigation-fleet management etc. “MONETARY” UPGRADES have been “minimal” since the 1980’s. Drivers are the lowest paid of all the Trades. Why would a Canadian high school graduate have any interested in a trucking career? I do hope periodicals related to trucking will finally be honest, regarding driver shortage> – John W.-Vancouver. Trucking companies have no one to blame but themselves. For years, the consensus was “truck drivers” are a dime a dozen. For the most part, the majority of trucking companies completely miss the mark when it comes to actually understanding who truly butters their bread. As someone mentioned above, drivers are the most scrutinized members of any industry, but rather than help to balance that loss of a sense of common courtesy or privacy, the issue is ignored. Consider how many drivers talk to friends and family, warning them to stay away from the industry. The work hasn’t changed. The change has been with employers, affording less respect, if that is, indeed possible, negligible benefits and salaries not befitting the skills required. Now, companies are desperate for drivers, and wonder why? Instead of trying to remedy a decades old problem, using common sense, they are hiring drivers without the skill or knowledge to provide service and maintain equipment. My husband and I are almost ready to leave the industry and we couldn’t be happier. No way would we recommend it to anyone, not without radical change. The millennial generation understand, far more than did we, the importance of respect, family/work life balance. If they stay away; good on them. It simply isn’t worth the sacrifice.